Russian Permanent Representative to the United Nations Vitaly Churkin. During his 10 years at the United Nations, the Russian permanent representative, who died on Feb. 20 in New York City, made a name for himself with his intelligent, powerful, and hard-hitting statements. Vitaly Churkin, Russia's ambassador to the United Nations since 2006, died in New York City on Feb. 20 from a heart attack. Words of condolence came from Moscow where President Vladimir Putin expressed his sympathy to the family, and Foreign Ministry official spokesperson Maria Zakharova described Churkin as "a great diplomat and someone very dear." Diplomats around the world also expressed their grief. Even Churkin’s arch-nemesis, former U.S. Ambassador to the UN, Samantha Power, wrote about Churkin: "diplomatic maestro & deeply caring man who did all he could to bridge US-Russian differences." Matthew Rycroft, the United Kingdom's permanent representative, described the deceased as "a diplomatic giant & wonderful character." On the rostrum of the UN Security Council, though, Churkin's good relations with his Western colleagues were not always clear. Defending Moscow's position, the diplomat was outspoken and hard-hitting in his statements. "The U.S. representative gave her speech as if she was Mother Teresa herself. Please remember which country you represent! Please remember the track record of your country. And only then can you speak from a position of moral or any other superiority. And then I think history and God will decide who is guilty of what." 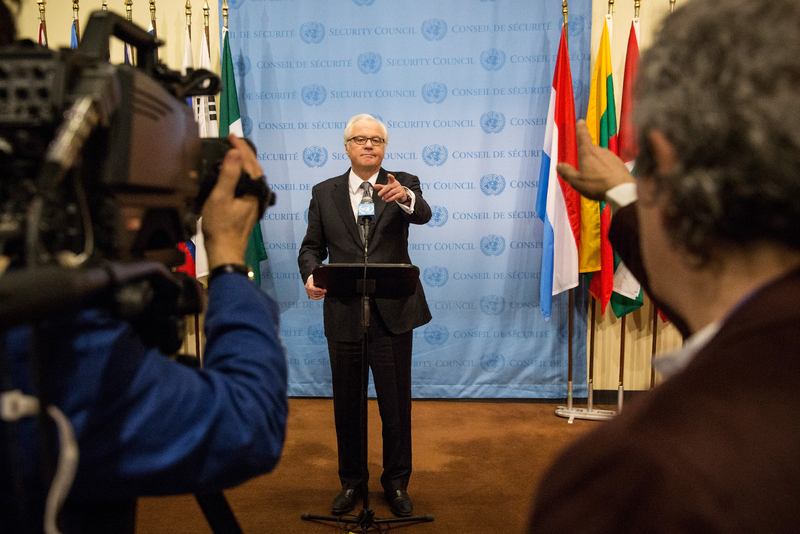 After the civil war began in Syria, Churkin often had to respond to criticism from his colleagues. In October, UN Undersecretary-General for Humanitarian Affairs, Stephen O'Brien, describing the situation in Aleppo, for which Western countries blamed Russia, cited Robert Burns, the 18th century Scottish poet. Churkin's response wasn't long in coming: "If we had needed a sermon, we would have gone to a church. If we had wanted to hear poetry, we would have gone to the theater. From the heads of the UN Secretariat one expects an objective analysis of the situation on the ground. You clearly did not manage this." Churkin often told his Western colleagues that they were not objective in their accusations against Russia, blaming it for the death of civilians in Syria, while at the same time Western countries themselves were just as guilty. In October, he recalled that [US-led] international coalition forces had conducted air strikes against the civilian population. "Therefore, esteemed colleagues, many will have to pray for forgiveness regarding the situation in Syria, and the situation in Iraq, and many other situations which we know about," Churkin said at the time. Of course, Churkin held the view that Crimea is an integral part of the Russian Federation. Earlier in February, replying to calls by the British and American permanent representatives for Russia to hand the peninsula over to Ukraine, Churkin said: "The American Constitution has these wonderful words: 'We, the people.' The people of Crimea very clearly expressed their will with the referendum [on Mar. 16, 2014]. Ninety-three percent of the population voted for reunification with Russia." Speaking to the British representative, Churkin suggested that the U.K. should first "return the Malvinas [Falkland] Islands, Gibraltar" and other territorial acquisitions and only then lecture Russia. Apart from Syria, the situation in Ukraine was another important issue at the UN. In April 2014, during a debate on the change of power in Ukraine, when President Viktor Yanukovych was ousted as a result of a violent coup, Churkin was ironic about the enthusiasm of his Western colleagues: "For some reason our Western colleagues think that if there is an armed coup - better an armed one - then most certainly democrats will come to power. Without fail, so to speak, a Thomas Jefferson will take charge of it all." In September 2015, commenting on Washington's decision to issue a limited entry visa to Russian Federation Council speaker Valentina Matviyenko, [who was subject to American sanctions], on the occasion of her speaking at UN Headquarters in New York, Churkin said that the U.S. was abusing its privilege as a host country and dealing a blow to its own reputation. "In propaganda terms, they shot themselves in the foot with this decision," the envoy said. In 2014, CNN presenter Christiane Amanpour accused the Russian envoy of refusing an interview because he didn't want to leave his "comfort zone" and answer awkward questions. Churkin replied in an open letter: "I spoke at the National Cathedral in Washington in 1983 two weeks after a South Korean airliner was shot down by a Soviet fighter by mistake, and then I gave evidence at the U.S. Congress in May 1986 after the accident at the Chernobyl nuclear power plant. So I can explain to anyone what it means 'to be out of one's comfort zone."